To celebrate the upcoming New Year festivities we commissioned EntwicklerX to create a special CANDI animated Workbench to count down the hours, minutes and seconds to New Year's Eve wherever you are in the world. As usual Thomas and Frank have outdone themselves and the result is the Fireworks CANDI countdown theme. 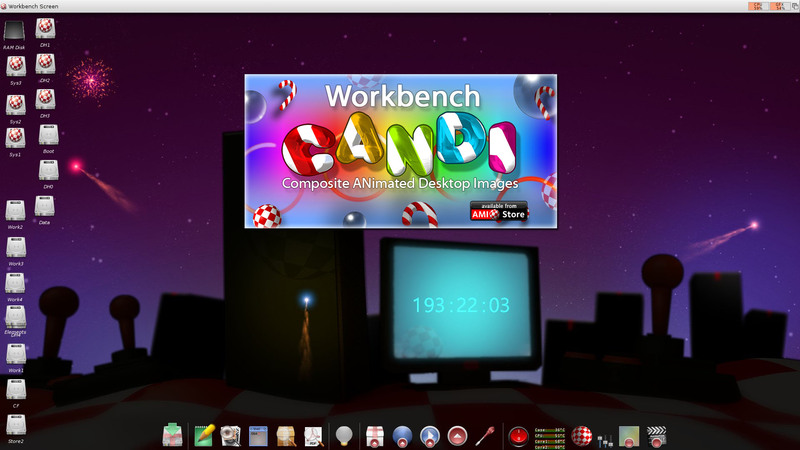 All registered Workbench CANDI owners can download the Fireworks CANDI free of charge via AMIStore. 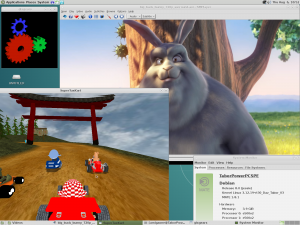 Workbench CANDI Seasonal review: Video - grabbed from an AmigaOne X1000 equipped with a RadeonHD 7xxx series graphics card using an Elgato HD60. Original music and remix courtesy RayneLeafe. Wishing all Amigans, whatever flavour or persuasion, a very happy, prosperous but most of all, peaceful New Year. With the end of another year in sight it's time to reflect on the past twelve months and look forward to the coming year. 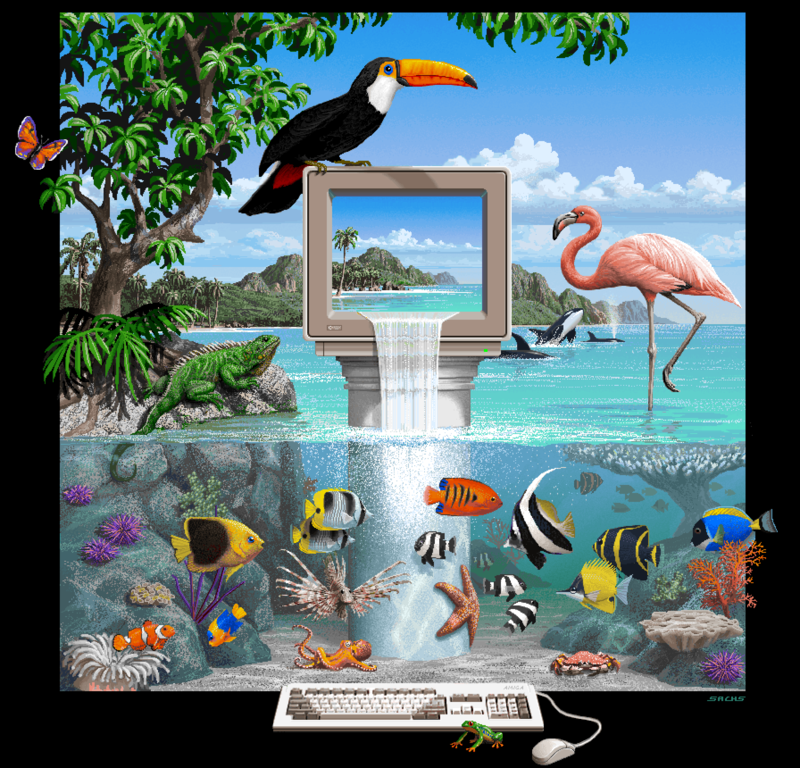 As all Amigans well know, 2015 is the 30th Anniversary of the Amiga's birth and the occasion has been celebrated and commemorated around the world by parties both large and small. I think it's fair to say that as we approach the end of the year it definitely has been a good time to be an Amigan, whatever your flavour or passion. 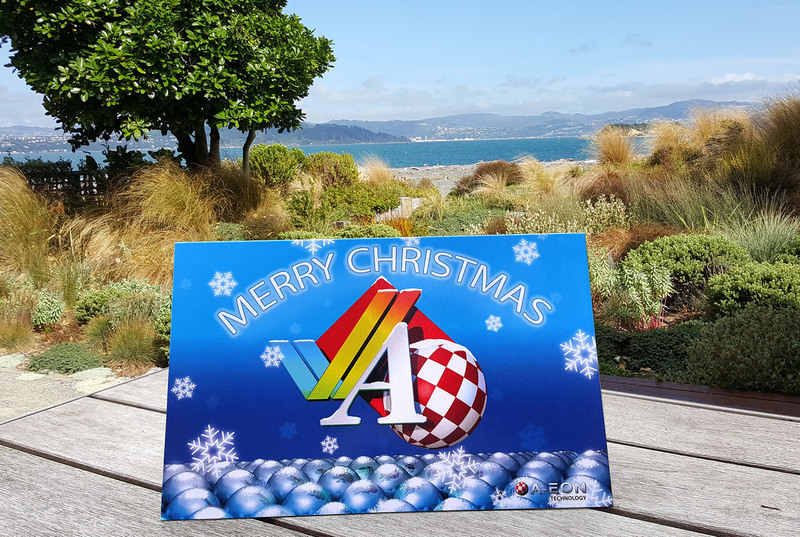 I've had the pleasure and privilege of sponsoring and attending many of the Amiga30th events that took place around the world. 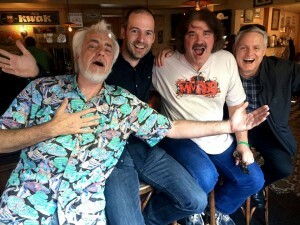 I've mixed with icons of the Commodore and Amiga community and spent time talking and drinking with numerous Amiga enthusiasts. I've written a personal account of my Amiga30th globe trotting experience which will appear in the next edition of Amiga Future magazine. 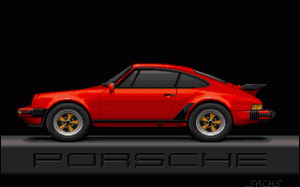 It's an Amiga Jim (Sachs) but not as we know it! 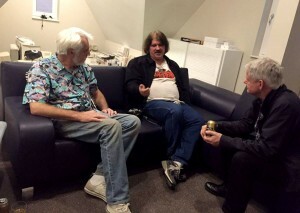 When I attended the Amiga30th event at the Computer History Museum in California in July, on the first day of the show I had the privilege of meeting with the great Amiga artist Jim Sachs. 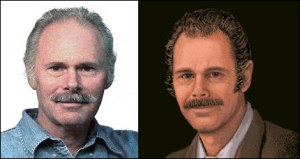 As all Amigans know, Jim is a leading computer artist whose talented graphics adorned many iconic C64 and Amiga games such as Saucer Attack and Defender of the Crown. 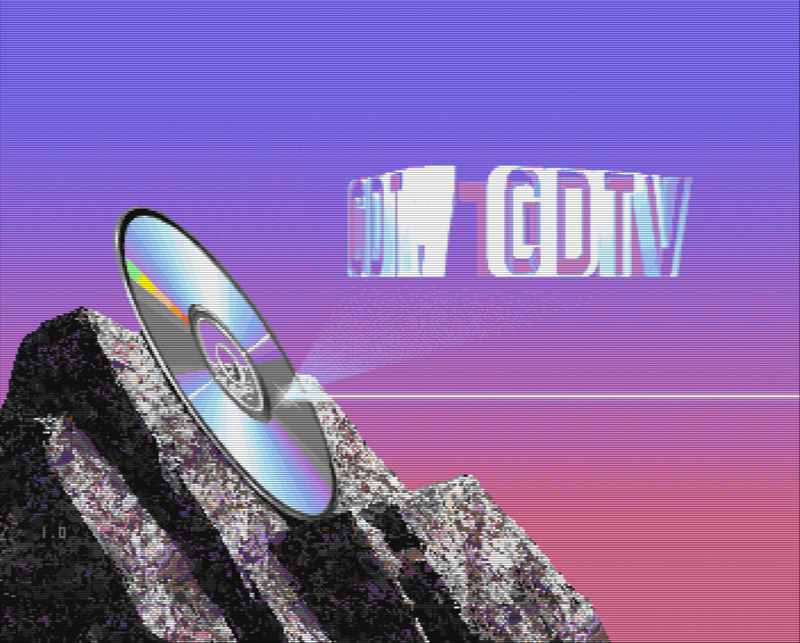 His distinctive artwork and style graced many other Amiga games and productivity titles, including the user interface and start-up animations for the CDTV and CD32 Amiga models. 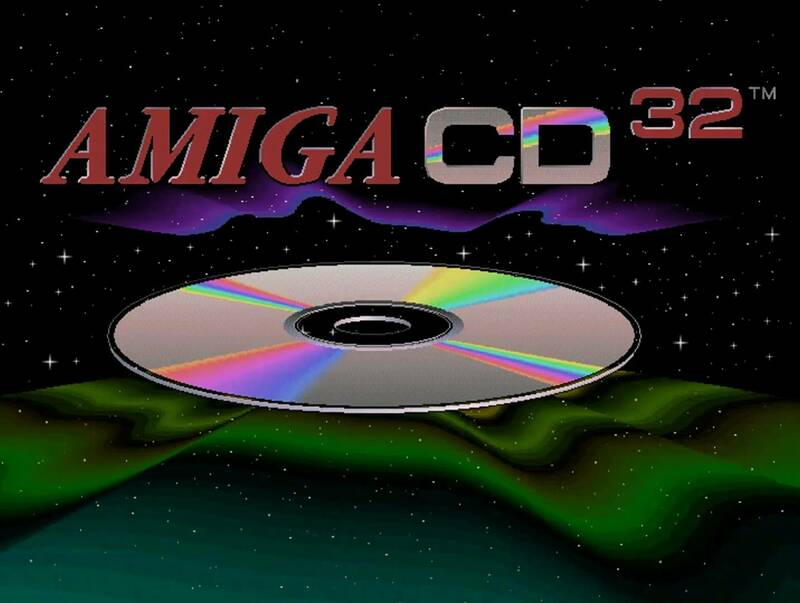 Shortly after we talked he came back to the A-EON Technology booth and asked me if I'd like a virtually unused Amiga CD32 which was still in its original box and packaging. 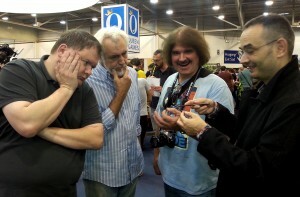 It was a PAL version that Commodore sent him to check the start-up animation he created for the machine. 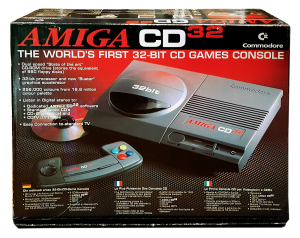 When he originally received the CD32 from Commodore he powered up the machine once to check the animation worked OK and after that, having no need for a PAL machine in the USA, he placed it back in the box and it has been sitting unused for the past ~21 years. Needless to say I quickly agreed to take the machine off his hands and the next day, true to his word, he came back to the show with the Amiga CD32. 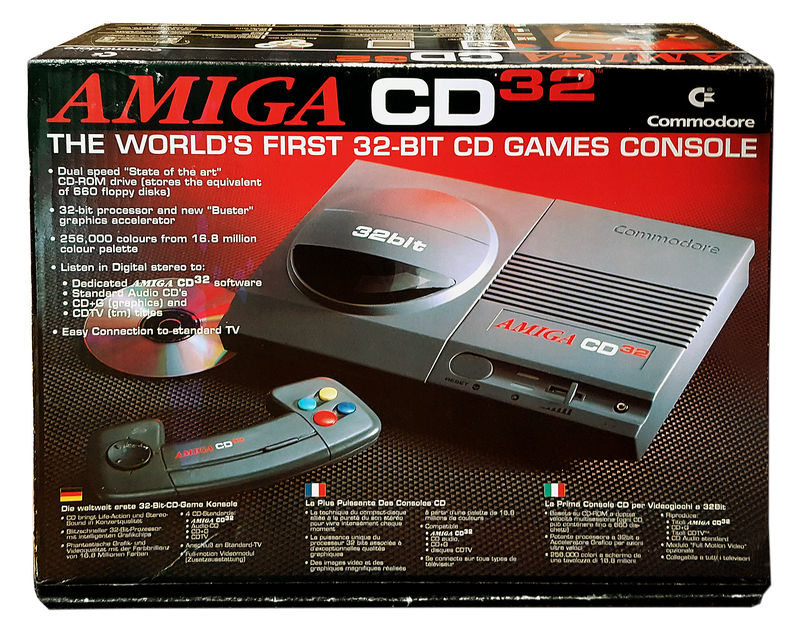 Unfortunately, I did not have enough room in my case to carry the boxed CD32 back home to New Zealand but SACC's Brian Deneen, graciously offered to keep it safe for for me until I returned to California for my annual trip to Amiwest. During my trip to Neuss to attend the Amiga 30 Germany show I had the chance to visit the Internationale Spieltage SPIEL show in Essen with RJ Mical, Dave Haynie, Michael Battilana and Marcel Franquinet. 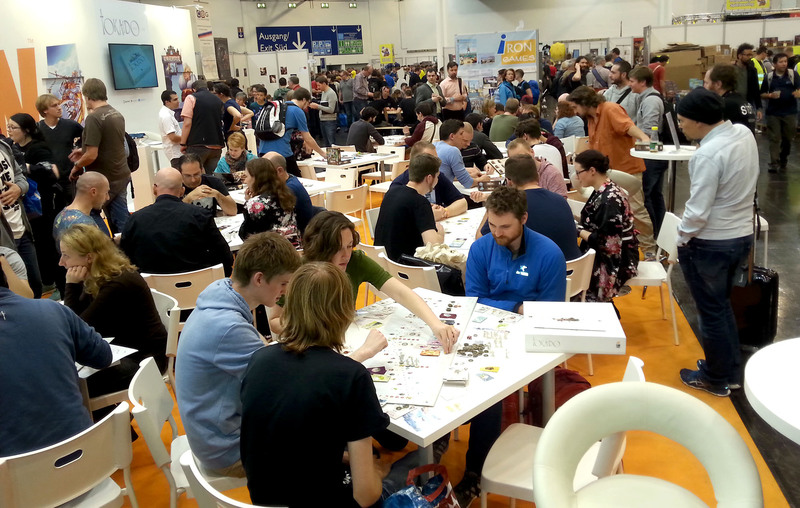 SPIEL is the biggest board games fair anywhere in the world. It is a massive annual four-day game fair with 910 exhibitors from 41 countries and this year a record 162,000 visitors attended the event. The large cavernous halls were filled with companies selling a myriad of simple and intricate board games with tutorial gaming sessions for the masses of people wanting to test the latest games. Amongst the vast array of board games and gamers we found a stall selling a selections of metal and wooden puzzles which we just had to try. 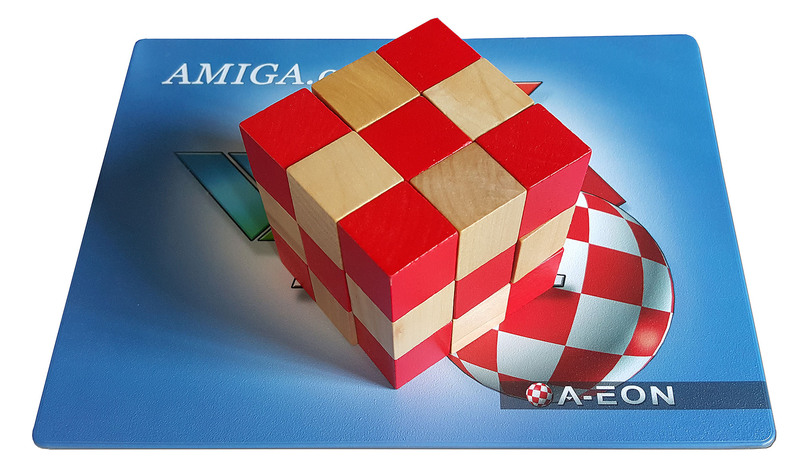 If you read my blog you will notice that I tend to spot Boing Balls everywhere and I was immediately attracted to a Red and White wooden cube "snake" puzzle which I just had to buy. 😉 I took my new Boing Cube to the Neuss show and offered a special prize of an Amiga.org mouse mat for anyone who could solve the puzzle in under 5 minutes. Only one person actually managed this! If the SPIEL Essen show was the largest board game show in the world, on the Sunday after the Neuss event Marcel drove RJ, Dave and me over to the World of Retro Gaming (3rd edition) show which was held in a tiny community centre in Stevoort-Hasselt, Belgium. We were joined by Paul Hamer who came along in his own car. It was a small show devoted entirely to Video game consoles and included a vast collection of game cartridges for Atari, Ninento Sega and Sony game machines. We did manage to find one CD32 game. As we walked around the tiny venue which consisted of 4 or 5 rooms crammed full with various console games it did not take long for some of the other visitors to realise that two of Amiga's finest were in their midst. No, I'm not talking about Marcel and me but of course Dave Haynie and RJ Mical. 😉 The cameras were soon out for the obligatory photographs and it was nice to see people thanking Dave and RJ for their contributions to computing and video gaming history. We did not buy any video games but when we came across a stall selling Video Console T-Shirts, RJ insisted on buying one for me. 🙂 They did not have any Amiga CD32 T-Shirts so I selected one with an image of the 16-bit Sega mega drive. Not that I had one of these machines but because of Commodore UK's famous bill-board advert placed outside Sega's London headquarters. 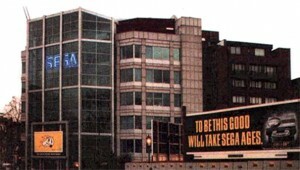 "To be this good will take Sega ages". Ah those were the days! 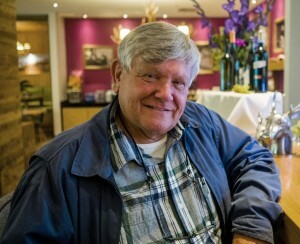 Afterwards he drove us back to our hotel in Neuss. It's only when you drive around this part of mainland Europe your realise just how close all the counties are together and within a few miles (or Km) the language changes from German to Dutch and French. 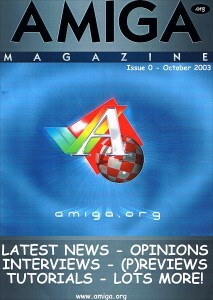 While I was vising Marcel's man cave he presented me with a pristine copy of Issue Zero of AMIGA.org Magazine which was published in October 2003 by "AOWorks". Kees Witteven and Cindy Hoek are listed as the joint Publisher/Editor and it was printed by Vanderheym/Computer City in the Netherlands. 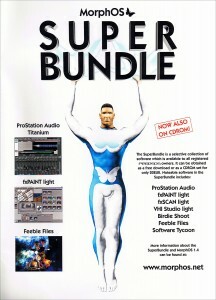 The list of writers and GFX artists includes Wayne Hunt, Greenboy, Andreas Loong, Andre' Siegel and many others. 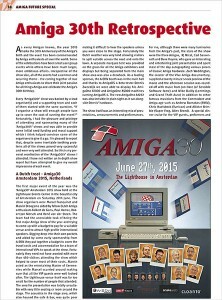 The issue is only 20 pages but the Editorial by Kees Witteven suggests that the magazine was planned as a professional monthly magazine along the lines of CUAmiga and Amiga Format. "Right we started it as we thought it would be a great asset to the community and at the time there we're not many magazines left. After we announced it and got together a team of enthusiastic volunteers; writers, gfx artists, editors etc, we printed issue Zero. However, a few days later Fleecy Moss from Amiga Inc threatened us with lawsuits and demanded huge sums of money since we used the Amiga name. That gave us such a bang in the face that some of the volunteers decided not to work with us anymore because they felt threatened as well and where afraid of being sued. We thought about changing the name into PPC Magazine or something but since everything gfxwise and lay-out wise was ready to go and the fear of being sued it all just fell apart ... Only issue Zero was printed ... we had content ready for 3 more issue's or something." 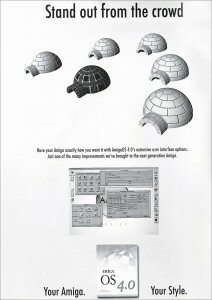 Apologies to the House of Stark and all the followers of The Game of Thrones for the misquote but I can think of no better way to announce the latest Workbench CANDI backdrop for RadeonHD equipped AmigaOS4.1 machines. Once again A-EON has commissioned the magicians at EntwicklerX to create a new CANDI theme to celebrate the Winter season (err Winter? - it's Summer here down-under!) They rose to the challenge and created a beautiful CANDI background with a rotating Boing Ball centrepiece and gently falling snow flakes which truly captures the Winter season. 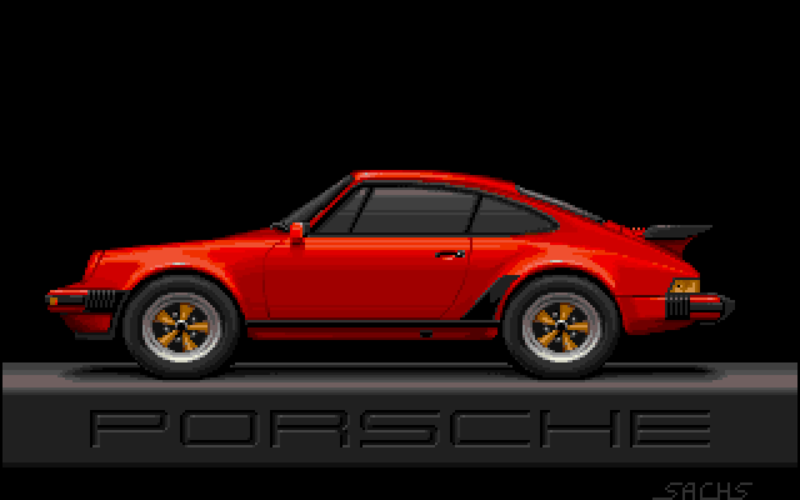 As with all the other CANDI backdrops, the Winter CANDI animation integrates seamlessly with the AmigaOS Workbench and is controlled with the CANDI preferences utility. Registered owners of of Workbench CANDI will be able to download the new CANDI version free of charge from AMIStore in the near future. Talking about AMIStore, a new version (0.663) has just been released which adds a whole host of features and improvements. The update includes better Amiga Menu support together with Sales & Promotions, Special offers and reworked multi-currency support. EntwicklerX is the first developer to take advantage of the new Special Offer feature and, from the 19th December through to the 1st of January 2016, are offering a special AMIStore Christmas discount on all their AmiBoing games. 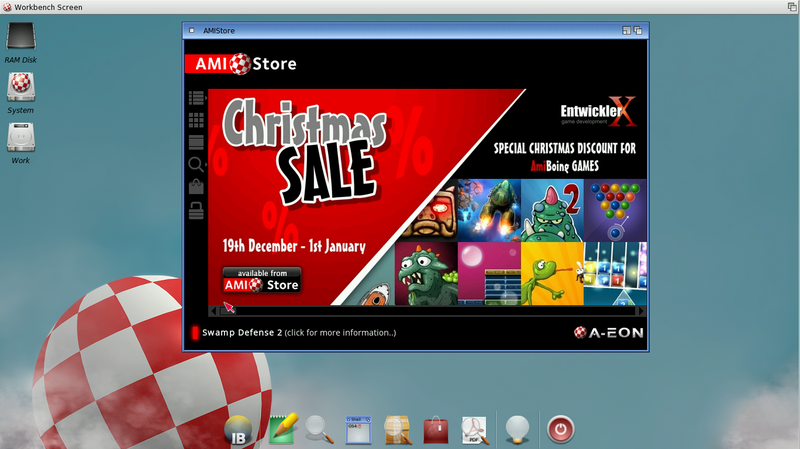 If you already have AMIStore installed on your AmigaOS 4.1 system you can update to the new version when you start the program. As I mentioned in an earlier blog, I managed to miss Petro Tyschtschenko at the Amsterdam Amiga30th show but I knew I had a second chance to get a signed copy of his book since he was delivering the opening address at the Neuss show. 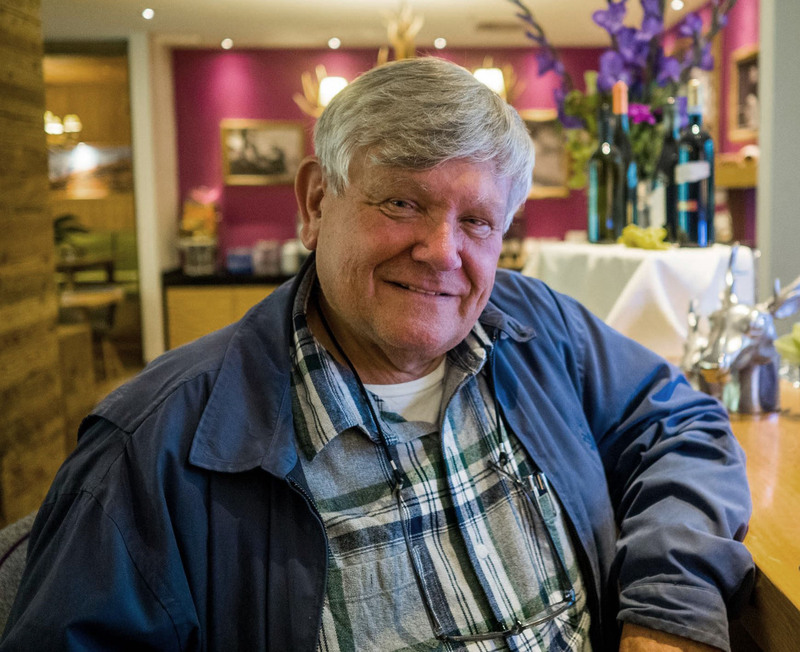 I bumped into him in the car park in Neuss as we were unloading the equipment to set up our respective booths. I could immediately tell Petro was very skilled and practiced trade show professional. All of his computers were neatly contained in matching packing cases which fitted perfectly into his car. 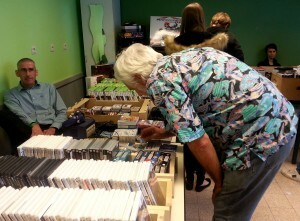 He also had a small trolley which allowed him to wheel all the cases into the venue in one trip. Ah, German planning and precision. 🙂 Petro again displayed his Walker prototype and was extremely busy posing for photographs and signing posters and copies of his book. However, I did managed to slip away from the equally busy A-EON booth to catch up with him for a couple of minutes during the show. He signed his book for me and wrote a nice dedication on the inside cover and also gave me an original "Keep the momentum going" signed poster. To my surprise and gratitude he thanked me for helping to keep the Amiga dream alive and refused to take any money for either the book or poster. 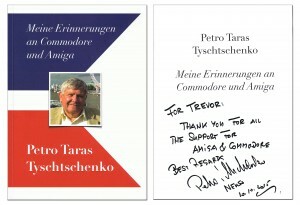 Thank you Petro you are a gentleman! Thanks to Jan Zahurancik and other members of the the A.L.I.C.E. team (Pat Wall & Ken Lester) I was able to demonstrate a beta version of the A.L.I.C.E. laptop at both the Neuss and Amiwest shows. 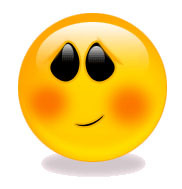 I have to admit that my A.L.I.C.E. laptop has since become my mobile workstation of choice. 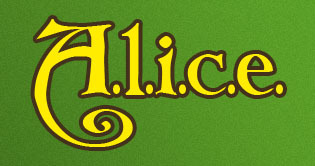 Thanks to A.L.I.C.E. 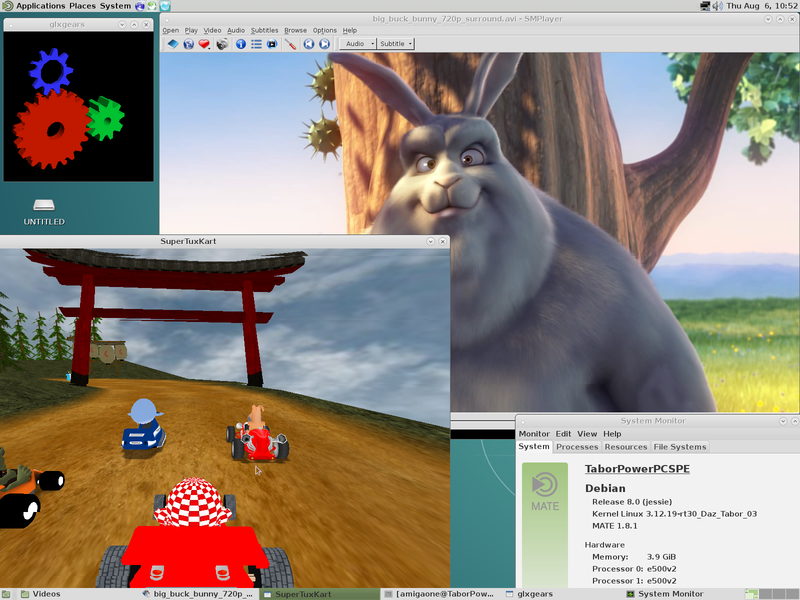 's "Rabbit Hole" feature, I can run my mainstream Linux applications from my AmiKit desktop while at the same time have access to my favourite Classic Amiga programs. 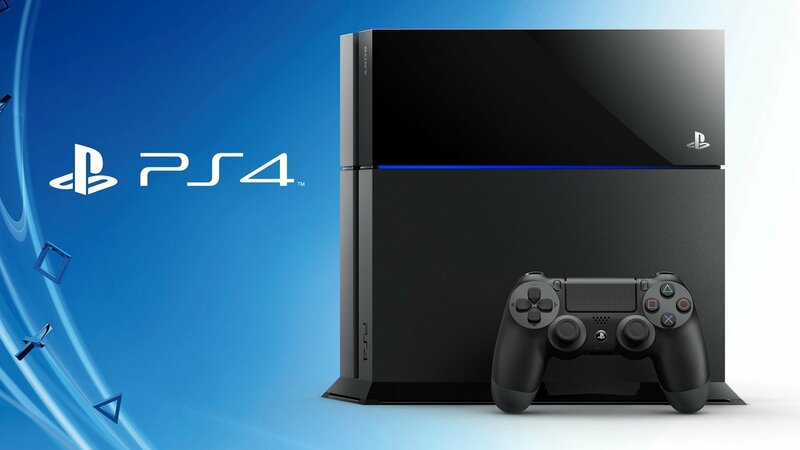 The combination is the best of both worlds and the lightweight emulation environment is very speedy indeed and, if I really want to, I can also boot into Windows or Linux. Now that Hyperion Hyperion Entertainment, in collaboration with Cloanto of Amiga Forever emulation fame, have made the Classic version of AmigaOS 4.1 Final Edition available for purchase as digital download this should mean emulating AmigaOS 4.1 on an x86 PC has official approval. It's a good job, since A.L.I.C.E. 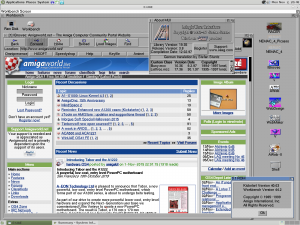 also supports AmigaOS 4.1. Classic. 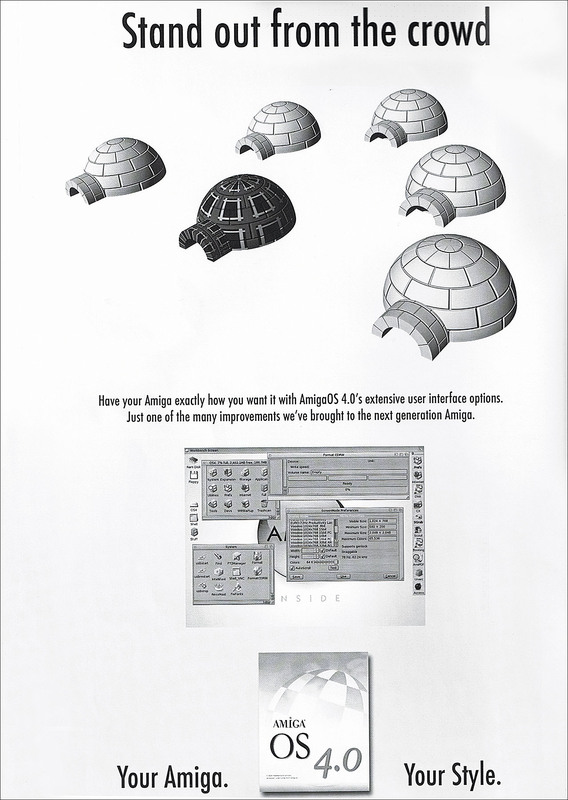 😉 Of course the Classic version of AmigaOS 4.1 does not really compare with the PowerPC version. 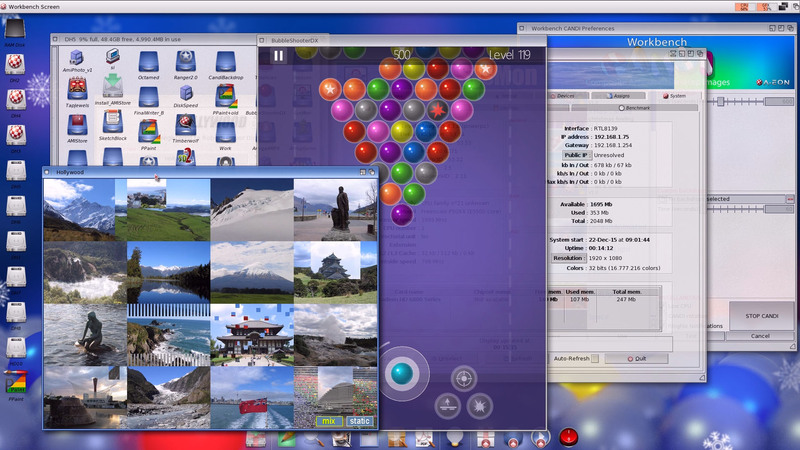 It lacks many of the advanced features of the PowerPC version and has graphics and memory limitations but if you are interested in seeing a cut-down version of AmigaOS 4.1 in action then this a good chance to try it out. 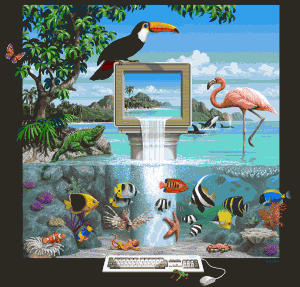 Once you have Amiga OS4.1 Classic on A.L.I.C.E. 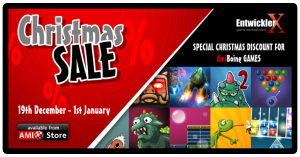 you can of course download and install AMIStore to gain access to the growing list of Classic and PowerPC games, applications and utilities that are available to purchase. 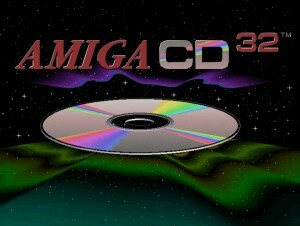 If AmigaOS 3.x is more to your liking you will be pleased to know that a beta version of AMIStore is being tested for AmigaOS 3.x. 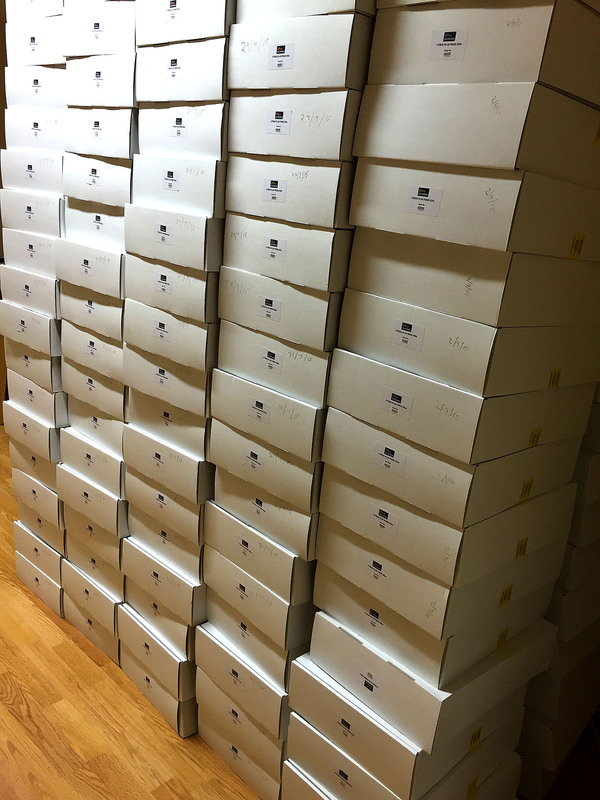 When this is ready you will be able to run AMIStore under AmiKit (and Amiga Forever) to select from the many 68k programs that are now being uploaded. 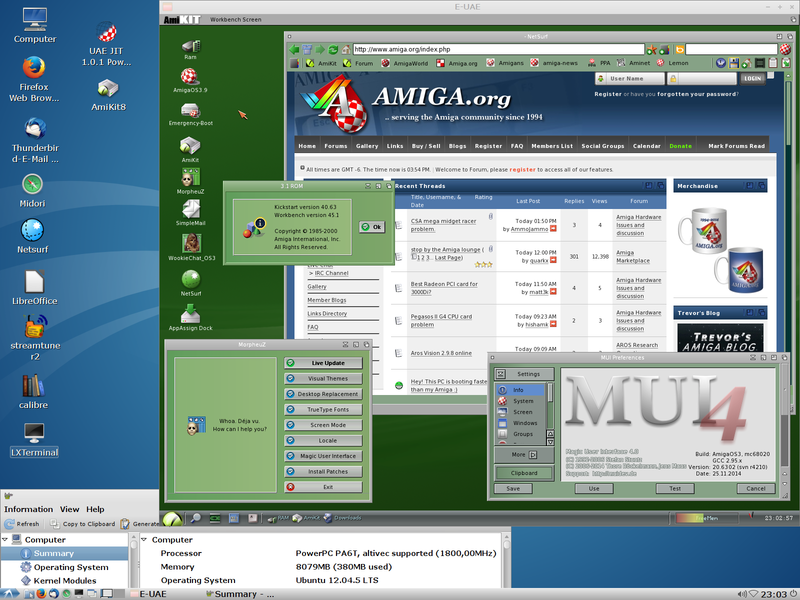 When AmiKit was released, way back in 2005, I was really impressed with the Classic Amiga distribution that Jan Zahurancik and his team had created and immediately wanted run AmiKit on my next-generation PowerPC based A1-XE. 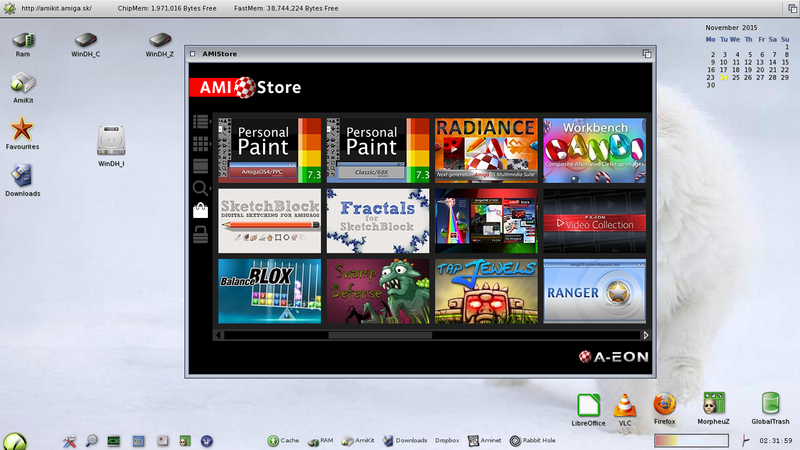 Eventually I donated an A1-XE to Jan to enable him to create a version of AmiKit for that machine. Unfortunately, at that time the A1- XE was really not up to the job of emulating a Classic AmiKit environment as any reasonably speed. These were the days before RunInUAE and JIT for E-UAE and the project proved more difficult than expected. Fast forward to 2015 and Christian Zigotzky, our Core Linux Wizard has done just that with his Tabor/AmigaOne 1222 beta board. 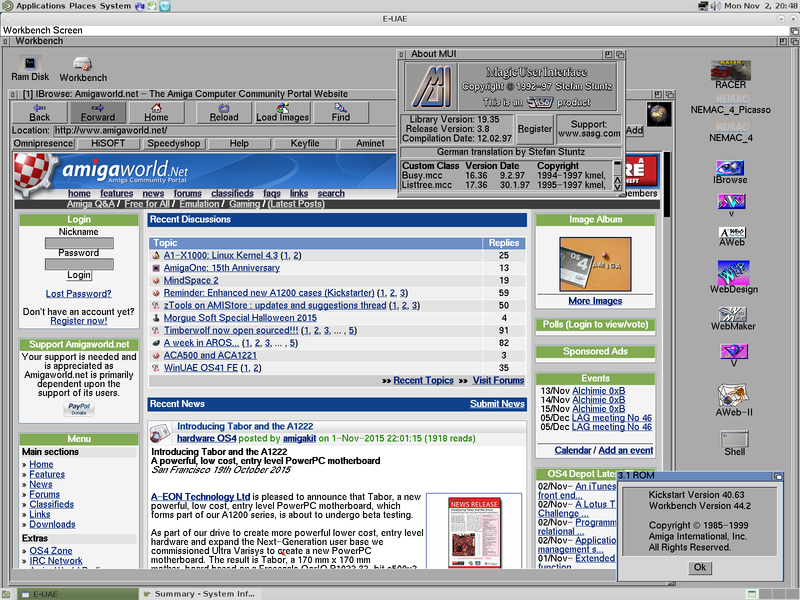 Not only has Christian managed to get AmigaOS 3.5 & OS3.9 running in emulation under Linux he has also managed, with some help from Jan and Almos Rajnai (the author of E-UAE JIT for PowerPC) to get AmiKit working as well. 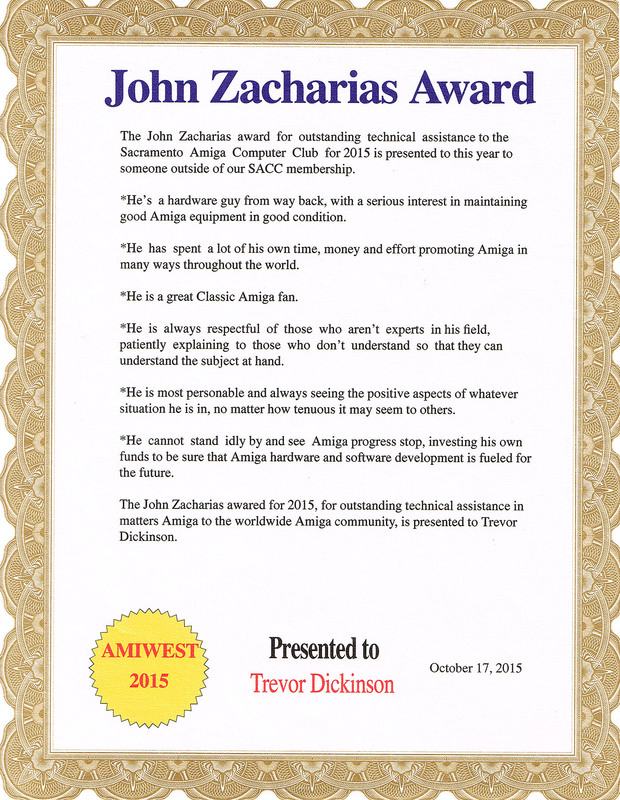 At Amiwest this year I had the honour and privilege of receiving the John Zacharias Memorial Award for 2015 from SACC (Sacramento Amiga Computer Club), the organisers of the Amiwest event. 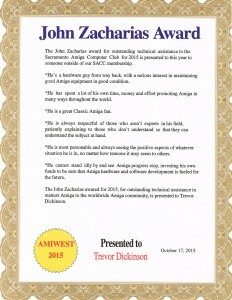 I felt doubly honoured as I think I am the first non SACC member to receive the award for "outstanding technical assistance in matters Amiga to the worldwide Amiga community". In another nice surprise, Darren Stevens, who was visiting Amiwest for the first time with his wife, presented me with a hand-painted mug incorporating the AmigaOne X1000 anniversary badge design and Kevin Saunders' Warp3D flying saucer artwork. I think the mug was hand-painted by his mother-in-law. Not only is Darren an active AmigaOS beta tester he is part of A-EON Technology's Core Linux team and specialises in generating Linux kernels for the AmigaOne X1000, AmigaOne X5000 and now the new Tabor motherboard which powers the AmigaOne A1222. 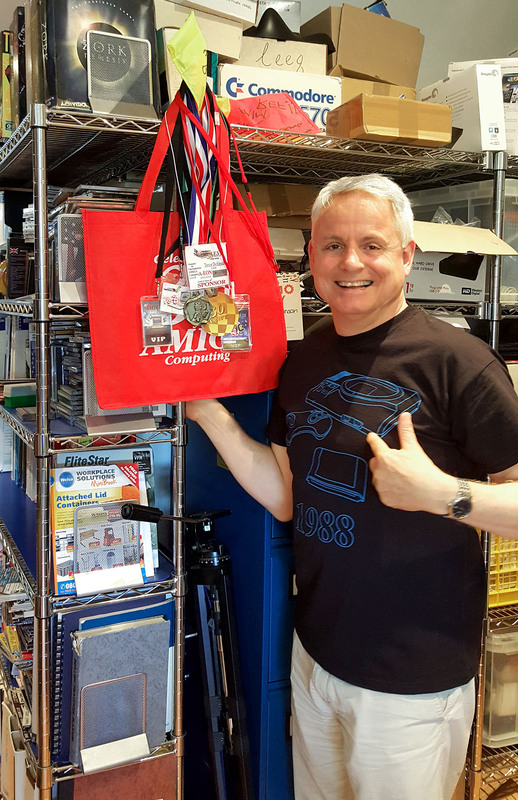 Thanks for the gift Darren, it's now sitting safely beside my Amiga 25th Anniversary and Amiga.org mugs. 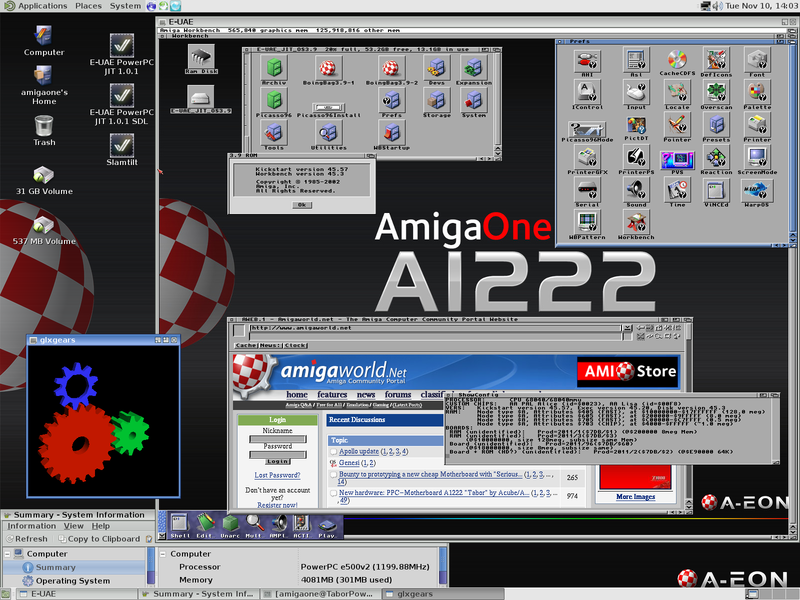 Thanks to everyone who has contacted me asking for a release date for the new AmigaOne X5000. Matthew Leaman is in control of the delivery schedule for A-EON Technology . Given the post Commodore history of broken promises and vaporware he is loathe to take anyone's money for pre-orders until Hyperion Entertainment give the final green light on AmigaOS 4.1.